When the time comes to decide whether continuing to live at home, rest assured Florida seniors now have more options than ever before. Yet one sentiment still rings true: this decision is often among the most difficult and confusing your family will face. While we can’t take away the emotion of the journey, we can help make the process easier by taking you through your senior living options and the pros and cons of each. This type of senior living offers a lifestyle choice for older adults who require little daily assistance, but seek a vibrant social community minus the hassle of chores and home upkeep. Choice of living options– You typically have a range of choices from condominiums and apartments to free-standing cottages or single-family homes. Worry-free living–You’re free of home upkeep and yard maintenance —typically included in your monthly fee—as are restaurant-style dining, basic housekeeping, laundry services and transportation. Amenities galore– A pool, fitness center and onsite beauty and barber salons are just the tip of the iceberg in many of these Florida senior living communities. Keep connected– The social opportunities are one of biggest draws for independent living with a range of educational and enrichment programs as well as organized activities and outings for you to enjoy. Ease of transition– Senior living communities in Florida commonly offer a continuum of care that includes independent living plusassisted living, and/or memory care all on one campus to support your needs while remaining in familiar surroundings. No onsite medical care– Not typically offered in communities that are strictly independent living, if you need assistance with activities of daily living or have serious health issues, this may not be the best fit. Stress of downsizing– It’s hard to leave your home and the process of downsizing and moving to a new, unfamiliar place can be overwhelming. However, knowing how wonderful the reward will be can help. This type of senior living in Florida includes housing, onsite care and support with activities of daily living while helping you maintain independence and enjoy an engaging, purposeful life. Personalized care– Not only will you have help with bathing, dressing and eating; access to onsite medical care including Physical, Occupational and Speech Therapyensures the right amount of support and the flexibility to quickly adapt to changing needs. Convenience– You’ll enjoy a homelike setting without the worry of home upkeep, cooking, cleaning and yard maintenance. Social opportunities– The worry of isolation is not a factor in an assisted living community as there are daily opportunities to connect and engage with a range of scheduled programs, activities and outings. 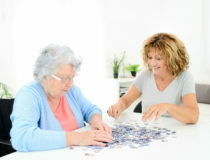 Group setting– After enjoying the privacy and independence of your own home; adjusting to a group setting can be hard. Specialized care– Assisted living typically does not offer the specialized care required for conditions such as Alzheimer’s disease or dementia. NOTE: We offer extensive memory care programs at our Serenades communities and as part of our Sonata South locations. This type of senior living in Florida offers care specifically designed to nurture and support those with Alzheimer’s disease and dementia. Expertise– The staff is specifically trained to assist those with Alzheimer’s and dementia providing individualized support that values their abilities and offers meaningful living opportunities. Safe environment– These communities include 24-hour supervision and typically feature layouts that are easy to navigate, more secure and may also use specific colors and lighting found to be soothing. 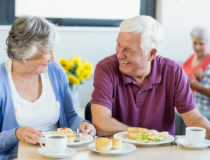 Enhancing quality of life– Memory care offers therapy, structured activities and programs with social opportunities and even dining options designed to enhance nutrition and independence. Caregiver benefits– The ability to reduce your stress and have more time with your loved one is invaluable as is being able to be their daughter, son, husband or wife again. Fear of the unfamiliar– Those with Alzheimer’s often rely on routine to feel comfortable and safe. An unfamiliar setting can bring about stress as can the challenges of adjusting to a group environment. Limited availability– Memory care is one of the fastest growing types of senior living and demand at times is may be more than there is space available. While the pros of staying at home are often close to your heart, the cons should be considered as well. They include safety concerns, risk of isolation, the challenge of keeping up with maintenance and chores, transportation issues, maintaining proper nutrition and properly managing medications. At the end of the day, peace of mind and many benefits of senior living in Florida may be the ultimate pro for you or your loved one. Scheduling a visit is the best way to get a feel for our community. During your visit, you'll be able to experience different living options, check out our numerous amenities, and speak to residents.